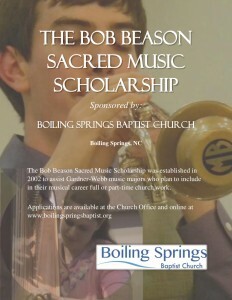 The Bob Beason Sacred Music Scholarship was established in 2002 to assist Gardner-Webb Music majors who plan to include in their musical career full time or part time church work. It is awarded by the Music Ministry of Boiling Springs Baptist Church in memory of dedicated choir member and church member Mr. Bob Beason. Applications are due to the church office by Friday, March 18, 2016.